The Hermitage in St Petersburg stands apart, in so many ways, from even the finest art galleries in Europe and, indeed, the rest of the world. There is, however, one aspect that marks it as similar; there are few works of art by women. Female artists are, happily, much more commonplace these days, but it was not always so. It comes as a surprise, then, to encounter works by women artists among the great collections. It comes as an even bigger surprise to note that one of the few women to be represented at The Hermitage – and who, indeed, became a favourite of the Russian royal court – was a native of Fife. Christina Sanders was born in Kinghorn in 1796. Little seems to be known about her early life or her first forays into painting. 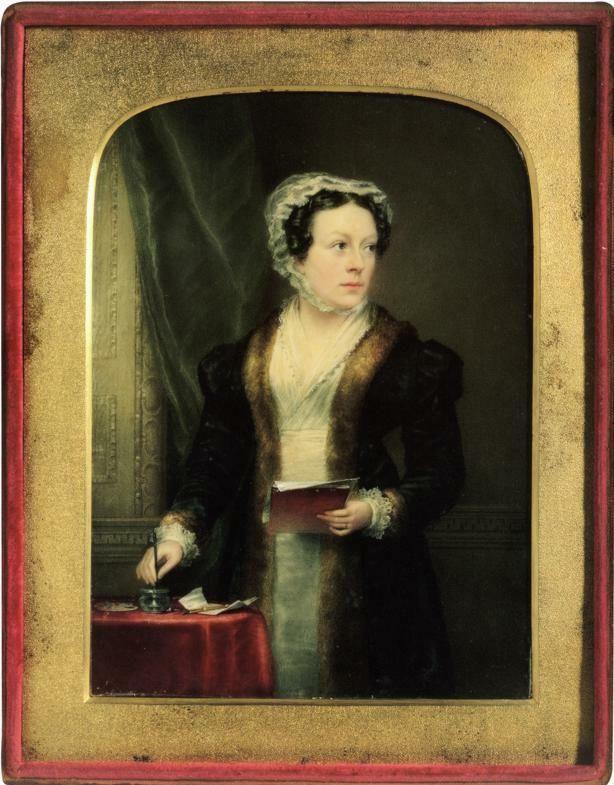 There appears to have been some art connection, however, as she married the artist James Robertson in 1822. The couple settled in London and the marriage produced eight children, though four died in childhood. What seems certain is that Christina must already have been quite a serious artist at the time of her marriage. In 1823, she was exhibiting works at the Royal Academy and by 1829, she had been elected as an honorary member of the Scottish Academy, a first for a woman. By the 1830s, she was making her name as a portrait painter, her work featuring in several magazines and journals. Through these, she caught the attention of the Russian aristocracy in St Petersburg. 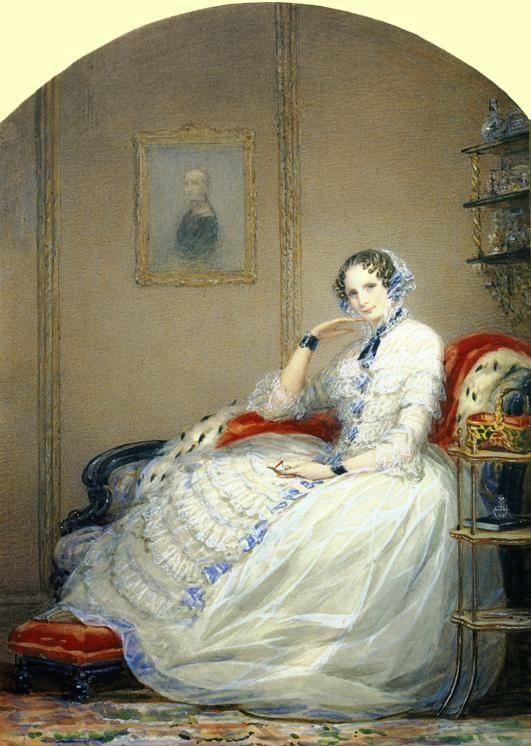 In Paris in1837, she painted portraits of a number of Russian nobles and notables. Doubtless, her talents were reported back to the Imperial Court by one or more of her sitters. It was a good time to be a British artist around the Russian court. 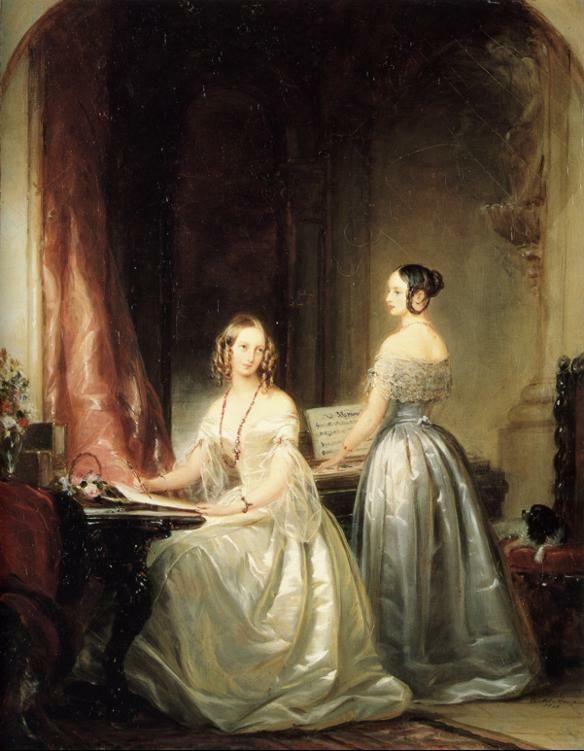 Russian high society had developed a love of all things British and by 1839, Robertson had exhibited several works at the St Petersburg Academy of Arts. The following year brought a major breakthrough when she was commissioned to paint full-length portraits of the Emperor Nicholas I and the Empress Alexandra. She received numerous other commissions and was soon elected an honorary member of the St Petersburg Academy before returning to Britain in 1841. Robertson was to visit St Petersburg again in 1847 and was to remain there until her death in 1854. Although relations between Britain and Russia were less than cordial – the Crimean War was looming – she remained a popular guest and continued to receive commissions from the Russian royal family. 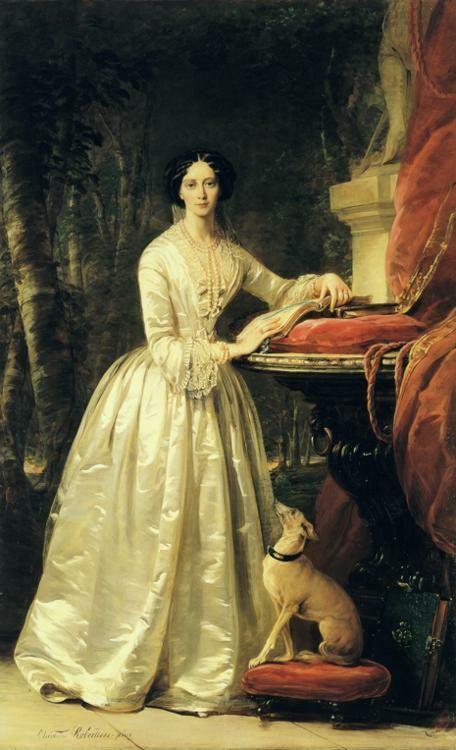 In particular, she painted several portraits of the Emperor’s daughter-in-law, the Grand Duchess Maria Aleksandrovna. She established her own studio in St Petersburg in 1849. Sadly, Robertson’s health was failing by the early 1850s and with suggestions that a number of her clients were refusing to pay her, she may well have been struggling financially as well. She died in St. Petersburg, in 1854 and was buried in the city’s Volkovo Cemetery, the final resting place for many writers, scientists and other esteemed figures. The Crimean War had commenced in 1853, so while Britain and Russia may have been at war, there appears to have been no personal animosity towards Christina Robertson. Even today, it could be argued that women are not fully recognised in the world of art. This was certainly true in the 19th century. A number of women were successful as novelists – though even a brilliant writer like George Eliot felt obliged to write under a male pseudonym – but very few even dared to embark on a career as a painter. Robertson was a rarity and there were few other women in her position. The Hungarian-born Serbian painter, Katarina Ivanovic, a younger contemporary, was one of the few, though she did not achieve the recognition of her Scottish counterpart, at least during her own lifetime. Christina Robertson, though, remains prominent in Russia today, though understandably her popularity waned following the Revolution of 1917, when all things relating to the aristocracy suddenly suffered a diminution of interest. Some fifteen of her works can be seen in The Hermitage and several more are on permanent display in the other great art gallery of St Petersburg, the Russian Museum. That, alone, is a testimony to her skill as an artist. The fact that she achieved what she did in such a male-dominated world is astonishing – and particularly remarkable for a woman from a small coastal town in Fife. This entry was tagged Art, Christina Robertson, Russia, St Petersburg. Bookmark the permalink. This is really exceptional. I was recently digging for female painters during the impressionist period. Not very fruitful I must say. You have given me some names in your article here that will prove helpful I am sure, though not necessarily impressionists. Thanks for an awesome post. And thank you for the kind comments. Female painters – at least in that era – are hard to find. We came across Katarina Ivanovic, or at least an exhibition of her work, in Belgrade. As for Christina Robertson, she was born about three or four miles from where we live and nobody in the vicinity seems to have heard of her! Your Duckholiday post came up in a web search for Christina Robertson. REading several was a delightful sidetrack and I look forward to reading the rest when time permits. Anyone interested in women artists would be interested in National Museum of Women in the Arts (NMWA) in Washington, DC, which curated the 2003 exhibition, An Imperial Collection: Women Artists from the State Hermitage Museum. It is a privilege for me to be closely involved with both NMWA and the State Hermitage Museum. During a personal conversation about women artists in the Hermitage collection with Hermitage Director, Mikhail Piotrovsky, he proudly noted the imperial portraits by Christina Robertson. My confession that I did not know of her incited a passionate tutorial about the importance of her work, and that lead to the beautiful exhibition. NMWA, (NMWA.org) opened in 1987, is the only museum in the world solely dedicated to promoting the cultural contributions of women in the visual, performing, and literary arts, from all countries, from the C16th to today. If Duckholiday ever crosses the pond to visit Washington, it would be my sincere pleasure to arrange a warm welcome and special tour of NMWA. Kathleen, thank you for the kind and interesting comments. I must confess that I knew next to nothing about Christina Robertson before I saw her work in the Hermitage, despite the fact that she was born only about three miles from where I live. I was able to take some consolation in the fact that nobody else in the area seemed to know anything, either. I remember thinking that her story must be so intriguing that there might be scope for a book, but in truth it took quite a bit of effort to find enough material for one article. While I have no immediate plans to visit Washington, I will certainly have a good look at the NMWA site. I have had a glance at it and I’m sure I will find plenty to interest and inspire me.